Home › Promotions › Chase Horizons. Get Rewarded. 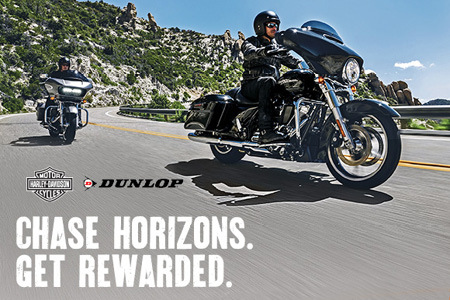 Purchase a set of qualifying Dunlop® tires from an authorized Harley-Davidson® retailer and receive a $60 Harley-Davidson™ gift card via mail-in rebate. Eligible tires include all Dunlop-Harley-Davidson co-branded tires, except for police-specific tires. Harley-Davidson™ gift cards will be provided by Dunlop.